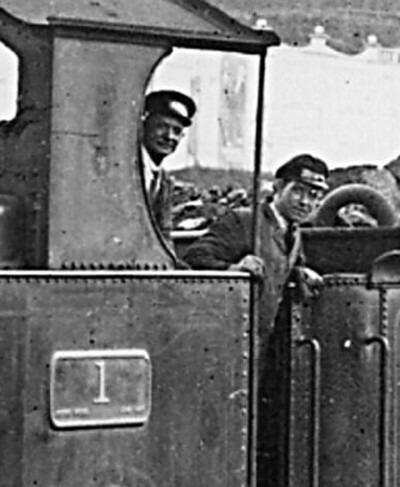 Phot shows a close up of the crew and mystery words beneath the number '1' on the cab side plate. Can anyone provide an explanation? The mysterious words should be: CREWE WORKS & [ a MONTH ] + [ a YEAR ] as the plate is a standard Whale type. Could it be Precursor, No.1, Clive, built June 06 which would tie in with the apparent short [ Month ] word. Although it cannot be read on the photo, LNWR numberplates followed a standard pattern. It should read CREWE WORKS on the left and the date the engine was built, month and year, on the right. Full details of LNWR engine numberplates are to be found on pages 73-74 of LNWR Liveries, published by the HMRS in 1985, and on pages 324-5 of An Illustrated History of LNWR Engines, published by Oxford Publishing Company, also in 1985.